Los Angeles celebrated the diversity of America this July 4th with the unveiling of the Freedom Sculpture, a brand-new work of public art in Century City. 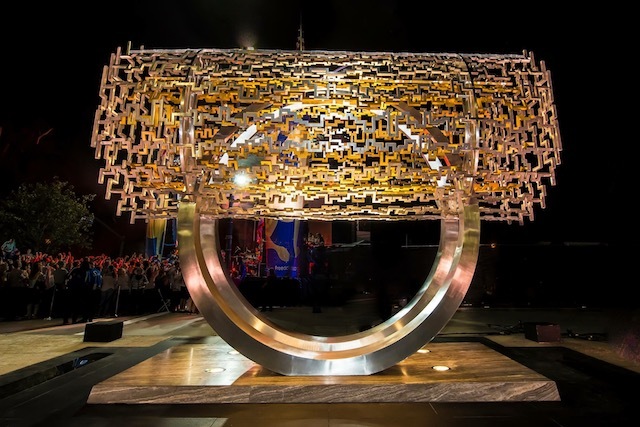 The Freedom Sculpture is a gift from the Farhang Foundation, an Iranian-American culture and arts nonprofit, and Mayor Eric Garcetti was among those on hand to celebrate its unveiling at the inaugural L.A. Freedom Festival on Tuesday. "The Freedom Sculpture is a testament to the values we hold dear and we are honored to receive it," Garcetti said at the festival, which drew over 70,000 people to the sculpture&apos;s location on a bus stop median off Santa Monica Boulevard, a spokesperson for the Farhang Foundation told LAist. Over one million people donated about $2.5 million to the Freedom Sculpture&apos;s crowdfunding campaign, with L.A. luminaries such as Elon Musk and Lynda Resnick lending support to the sculpture. The two vast, stainless-steel concentric cylinders that make up the Freedom Sculpture were designed by renowned architect Cecil Balmond, who drew inspiration from the Cyrus Cylinder, a 2,500-year-old Persian artifact often referred to as "the first charter of human rights." "The Freedom Sculpture, is a &apos;Statue of Liberty&apos; for the West Coast — It is an Iranian-American led, widely crowd-supported public monumental gift," according to the official website of the sculpture. The sculpture&apos;s unveiling comes at a time of increasing unrest for L.A.&apos;s Iranian community, many of whose members feel targeted by President Trump&apos;s revised travel ban, the LA Times reports. Iran is on the revised list of six Muslim-majority countries that will be affected by the ban; the Farhang Foundation&apos;s erection of a monument dedicated to diversity, in the heart of one of the most diverse cities in America, may be seen as a testament to the city&apos;s commitment to inclusion. The Freedom Sculpture is at 10000 California Route 2, Los Angeles.